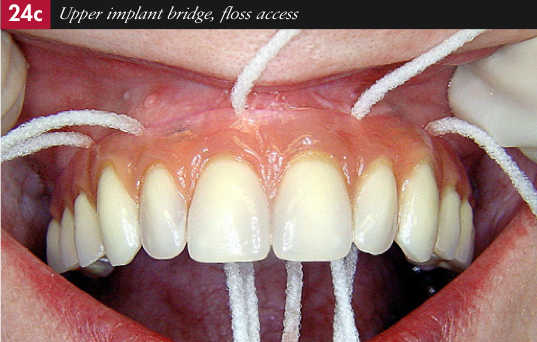 Carla is a very lovely lady who presented with the complaint that her upper left bridge kept falling out every time she tried to speak or open her mouth (fig. 1a). All she wanted was to have it glued back so that it would stay put. 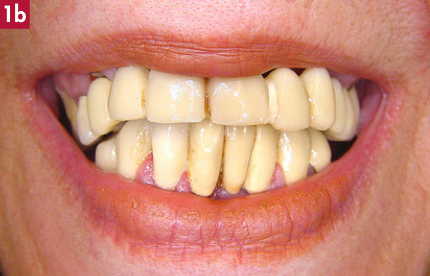 The rest of her teeth moved in as she breathed in and splayed out as she breathed out. 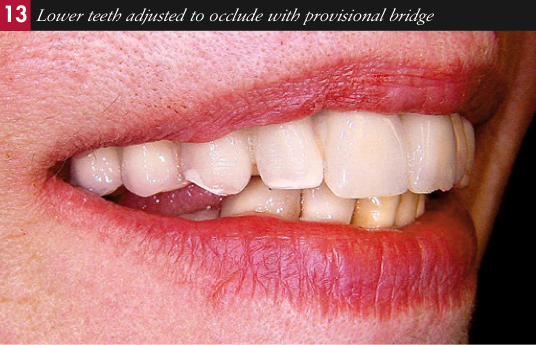 Although her concern was for the dislodged bridge it made much more sense to take a holistic view on her failing dentition (fig. 1b). Totally oblivious to the extent of her oral disease and restorative failure, she was insistent that all she needed was some strong glue! It came as quite a shock and took several visits including an emotional meeting with her daughter and myself to convince her as to the extent of her oral breakdown. We then had to explain how health, function and aesthetics could be restored and what it would involve. With a look as if to say, ‘Can they save me?’ (Fig. 2), she hesitantly accepted her fate. 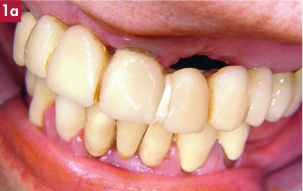 Management of failure in the restored dentition is always a challenge. 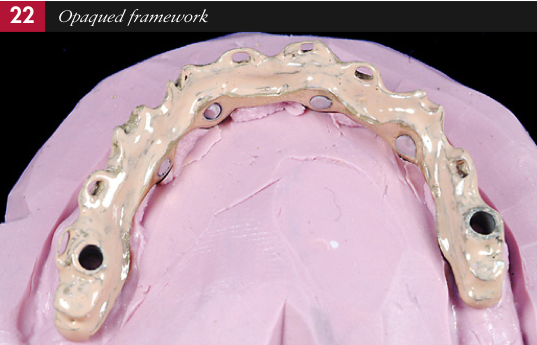 Each case is unique and tests the skills of clinicians and technicians alike. Adherence to well established principles is essential if success is to be achieved. 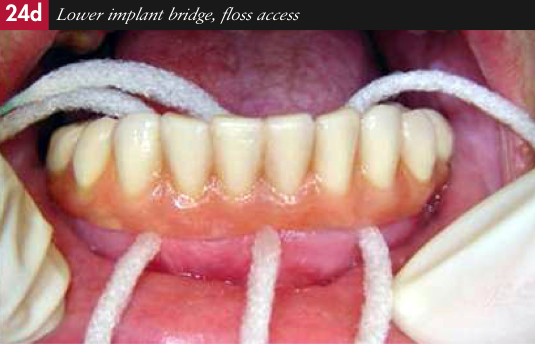 The choice of restorative options is constantly expanding with patients now being offered a diverse selection of both clinical and technical procedures. 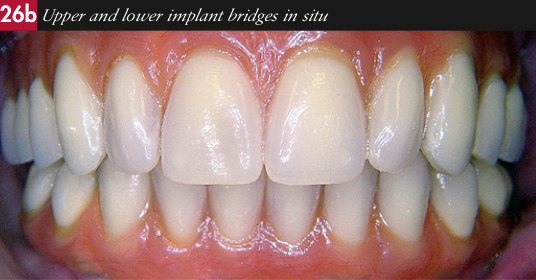 Removal of failed bridgework, extraction of unsalvageable teeth, placement of implants into the extraction sites and their immediate loading with a pre-fabricated restoration is one such option. 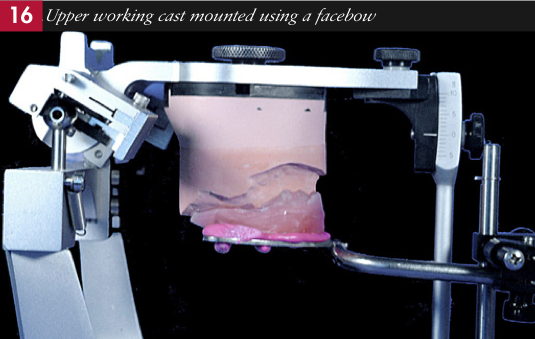 fabricated and mounted on a semi-adjustable articulator. 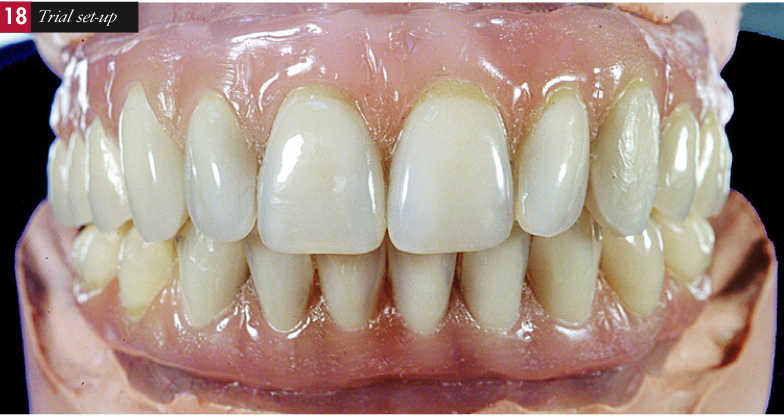 The over-erupted lower incisors were trimmed down and a guide made to accommodate a more favourable occlusal plane (fig. 6). 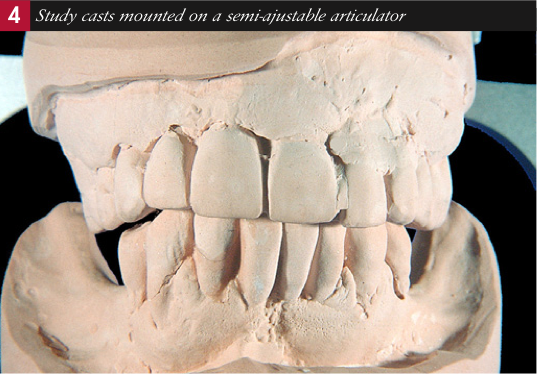 The upper teeth were then removed from the cast and the residual ridge selectively modified, particularly in the posterior region where down- growth of the maxilla had created a reverse occlusal plane. 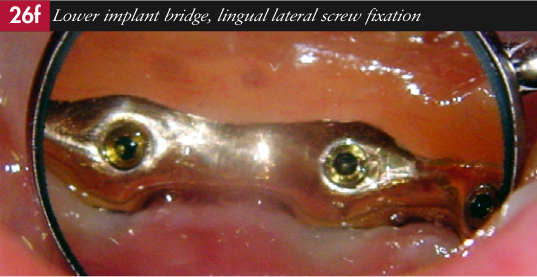 Stock teeth were then set up to the modified lower cast (fig. 7). 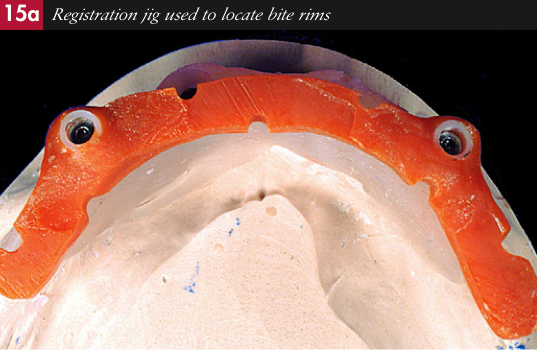 The remaining, cut-down lower teeth were then removed from the lower cast and stock teeth set against the upper set-up (fig. 8). 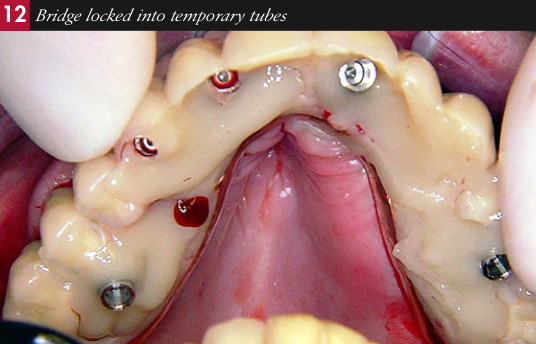 The upper teeth were processed, incorporating a cast framework to provide a rigid structure with space to locate and attach implant retained cylinders (fig. 9). 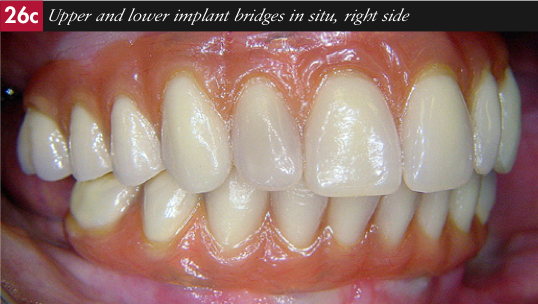 The lower was processed as a conventional acrylic denture. 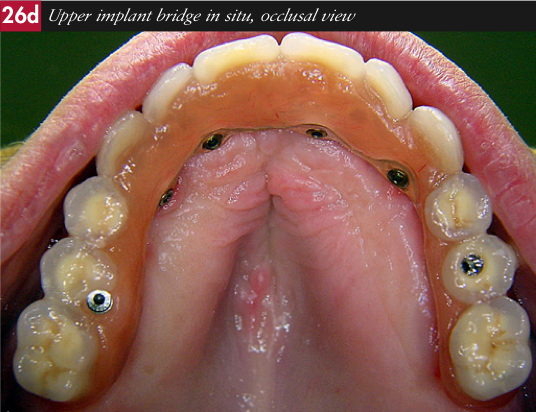 The upper bridgework was removed and the remaining teeth carefully elevated to conserve as much bone as possible (fig. 10). 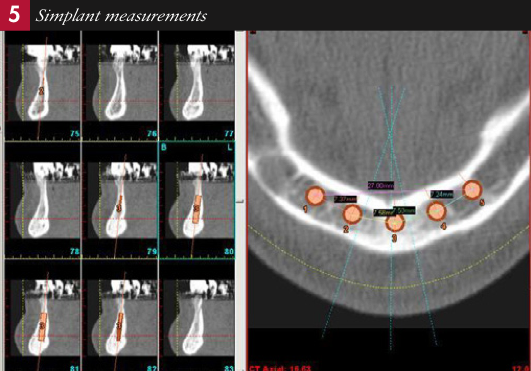 Implants were placed into six of the extraction sites (fig. 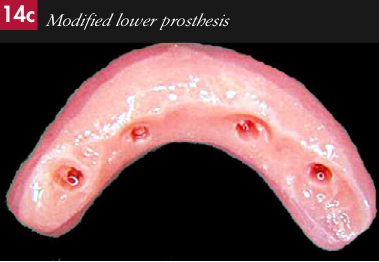 11), five were immediately loaded with the pre- fabricated prosthesis (fig. 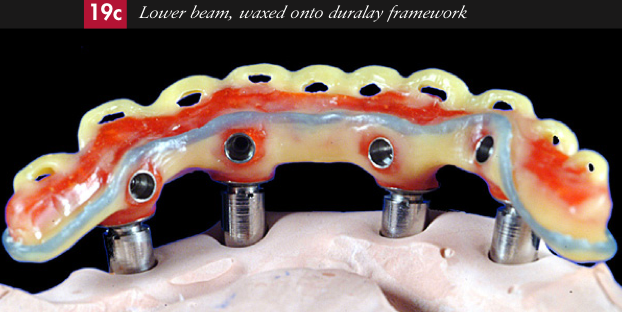 12), and the lower teeth trimmed down to occlude using the pre-fabricated jig (fig. 13). 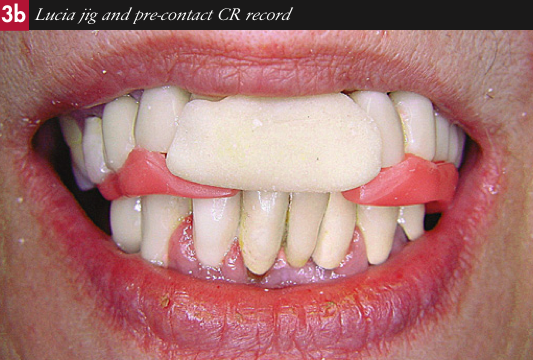 Two weeks later, the lower teeth were extracted (fig. 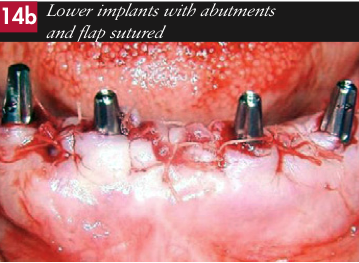 14a), implants placed (fig. 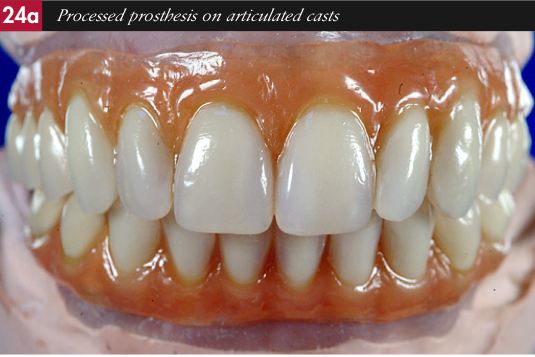 14b) and immediately loaded with the pre-fabricated prosthesis (fig. 14c). 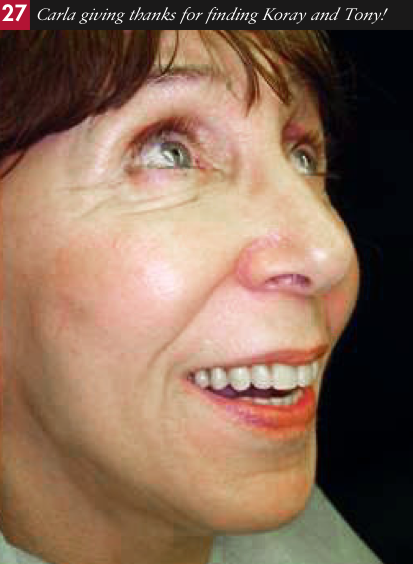 After one year (three to six months would have been more appropriate, but Carla was so happy with the provisional prostheses that she kept delaying the definitive stage) the interim prostheses were removed, and implant head impressions taken. 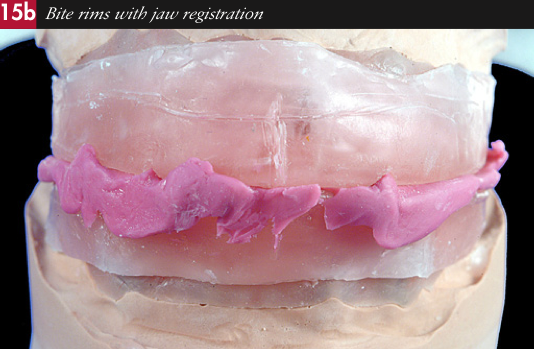 Casts were fabricated and jaw registration jigs with bite rims were constructed (fig. 15a). 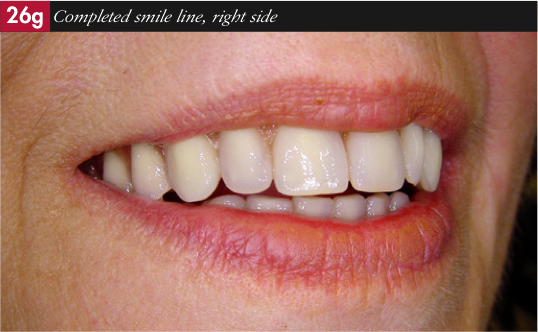 These were used to capture the maxillary/mandibular relationship, centre line, smile line, canine position and buccal corridor position (fig. 15b). New face bow and jaw registrations were also taken. The working casts were mounted (fig. 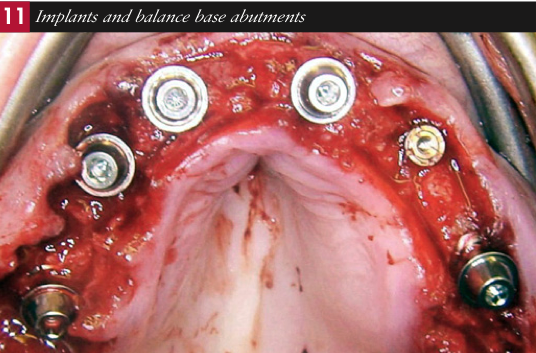 16) and appropriate abutments selected (fig. 17). A trial set-up was produced (fig. 18) and tried in. Modifications were made and indices then fabricated. 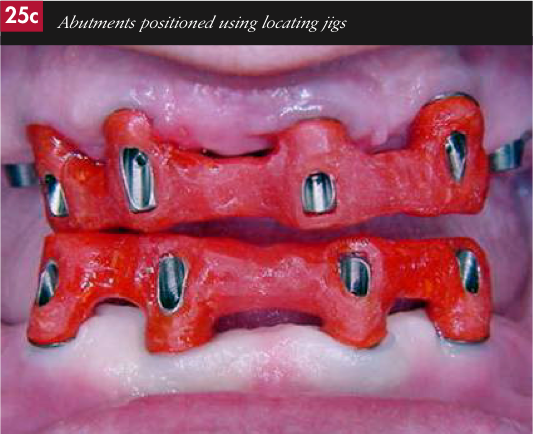 Cast rigid substructures with lateral screw fixations were fabricated with the use of the indexed teeth as a guide to incorporating support and retention (figs. 19a-d). 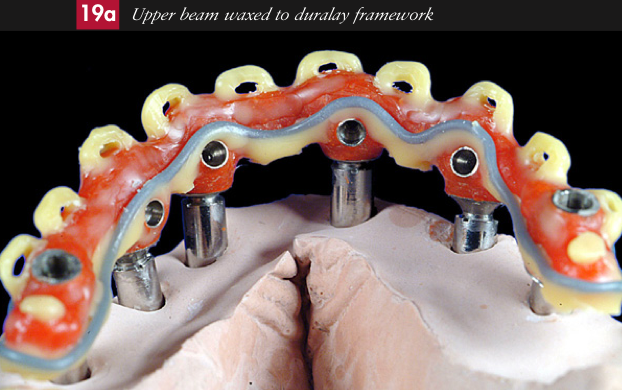 The teeth were waxed to the frameworks (fig. 20). the restoration was then sent to the surgery to be tried in. Once checked in the mouth for form, function and phonetics, and with Carla happy with the aesthetics, they were returned to the laboratory to be processed. 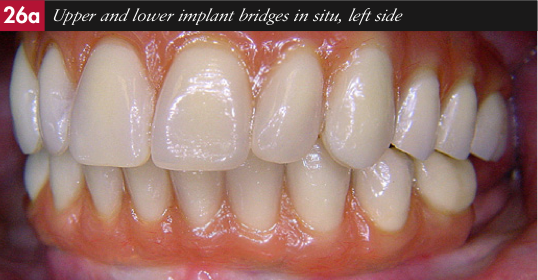 Abutment analogues were screwed into the frameworks,. 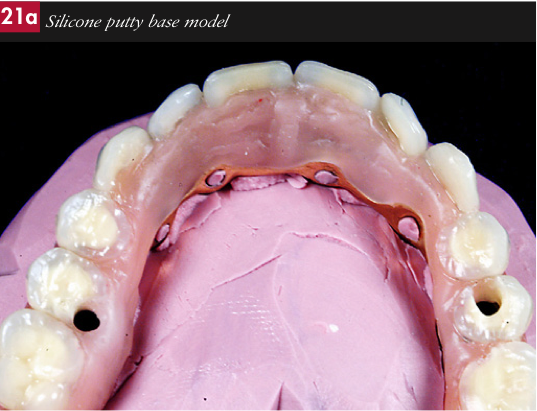 Silicone putty base models (fig. 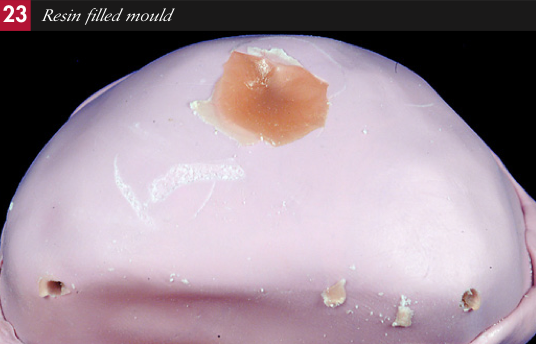 21a) and moulds were then made (fig. 21b). The moulds were separated, the teeth removed and all traces of wax thoroughly boiled off both the teeth and the frameworks. 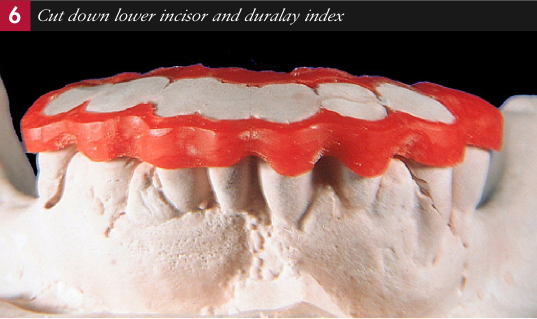 The surfaces of the teeth to be bonded were then air abraded with 90 micron aluminum oxide, placed in the mould and conditioned with monomer. The frameworks were opaqued (fig. 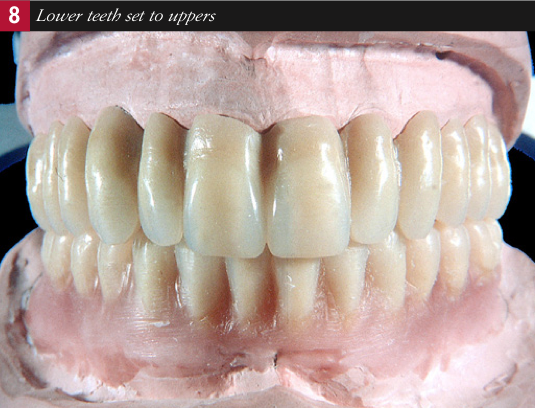 22) and positioned back in their respective moulds together with the teeth. 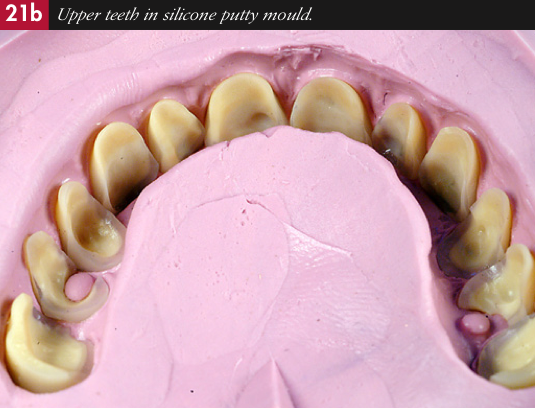 The moulds were sealed with a further addition of silicone putty. 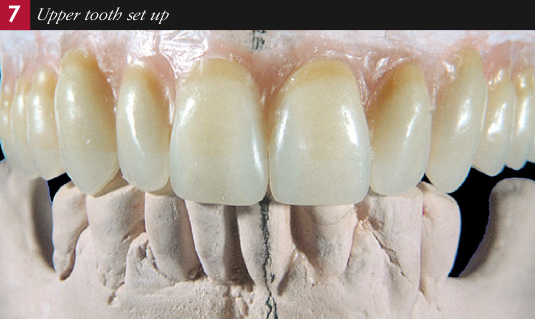 Gingival coloured autopolymerising acrylic resin was poured into the moulds and cured in a hydro flask of warm water at 2 atmospheres of pressure (fig. 23). 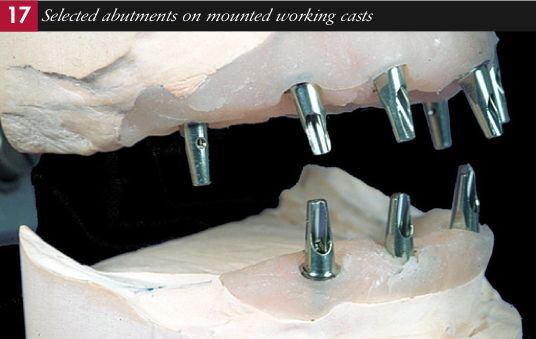 The processed prostheses were removed from the moulds, adjusted on the articulated casts (fig. 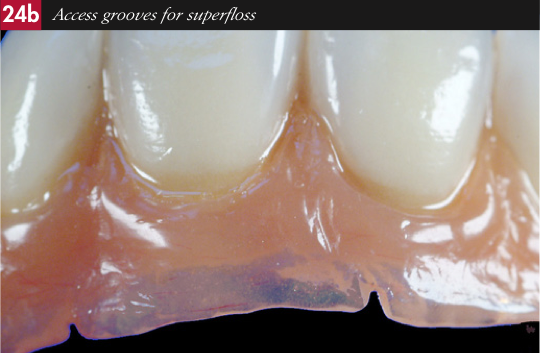 24a), trimmed, access grooves for superfloss incorporated (fig. 24b) and finally polished. Transfer jigs (figs. 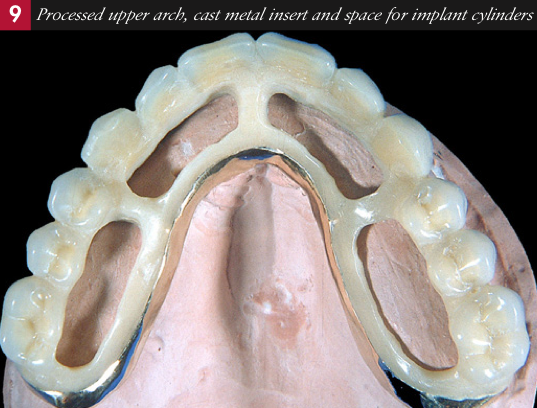 25a-c) were made from GC Pattern Resin to ensure the correct location of the abutments intraorally prior to screw-retaining the definitive prostheses to them. 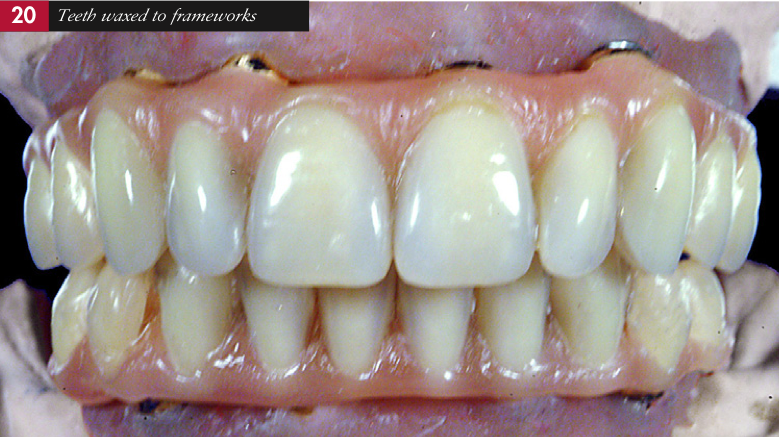 Carla was restored to health and function with immediately loaded implants, supporting screw-retained cast fixed beams, veneered with acrylic stock teeth and gingival coloured autopolymerised acrylic resin (figs. 26a-h). Perhaps the thought behind her smile (fig. 27) is that she found her knights in shining armour! 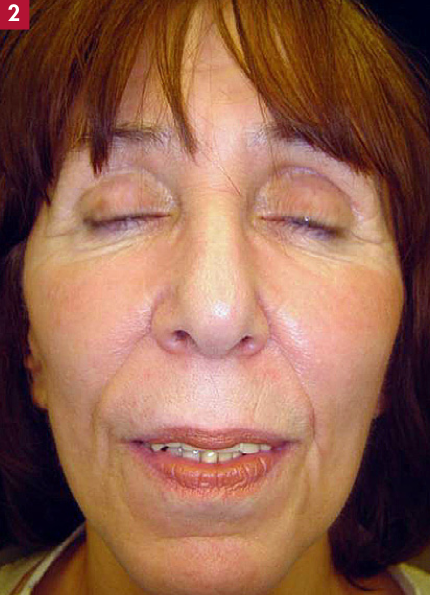 Carla was treated by Dr Koray Feran, who I would like to thank for allowing me publish his clinical material.